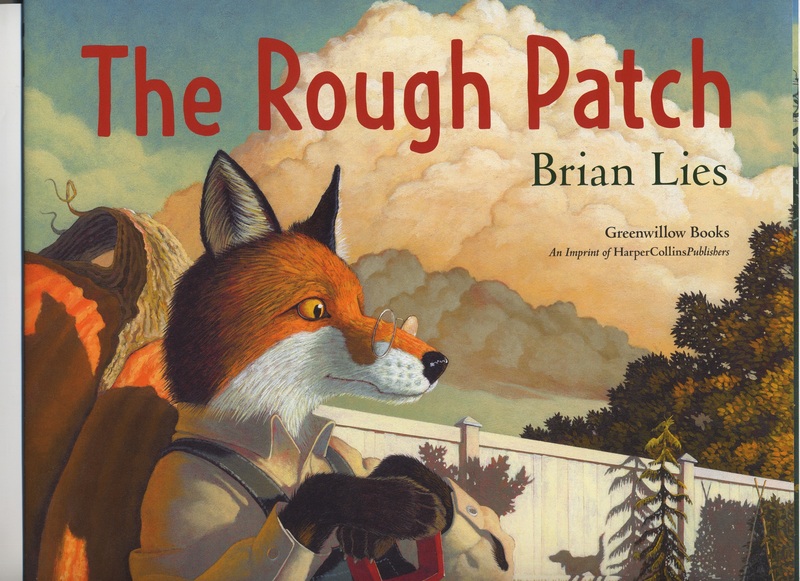 I’ve a review over at BookPage of Brian Lies’ The Rough Patch (Greenwillow, August 2018). The review is here, and Brian visits today to talk about the process behind this moving picture book. I thank him for sharing. 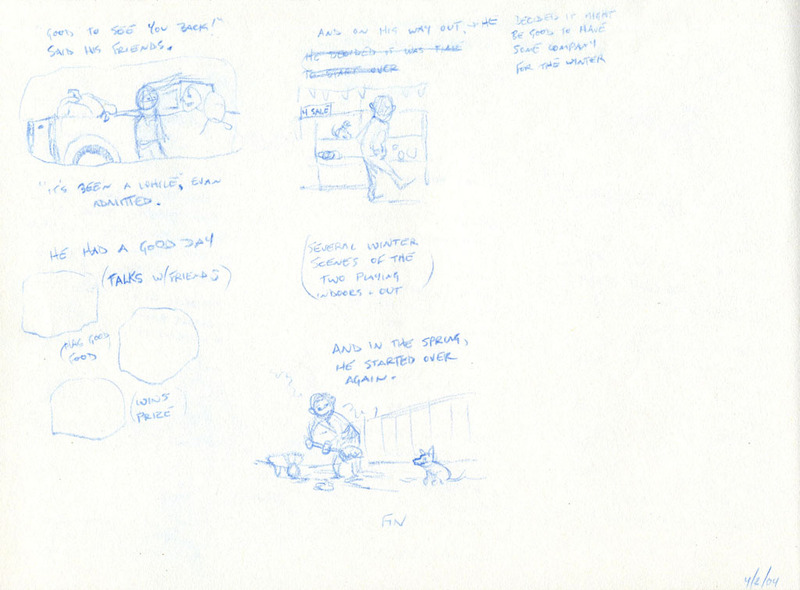 Brian: When I first thought of the story, I scribbled it down in one burst of words and images in one of my sketchbooks. This is the last of three pages. 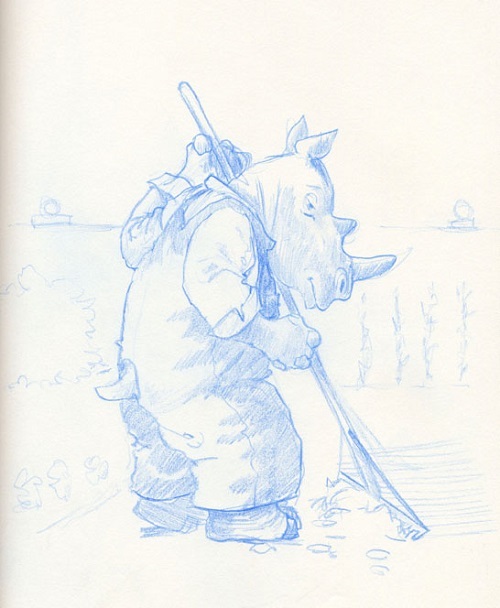 The idea stayed in the sketchbook for over a decade before I decided I had to move forward with it. It was like a log jam breaking up. I’d been thinking about various ways of telling the story but hadn’t decided which was the right way. 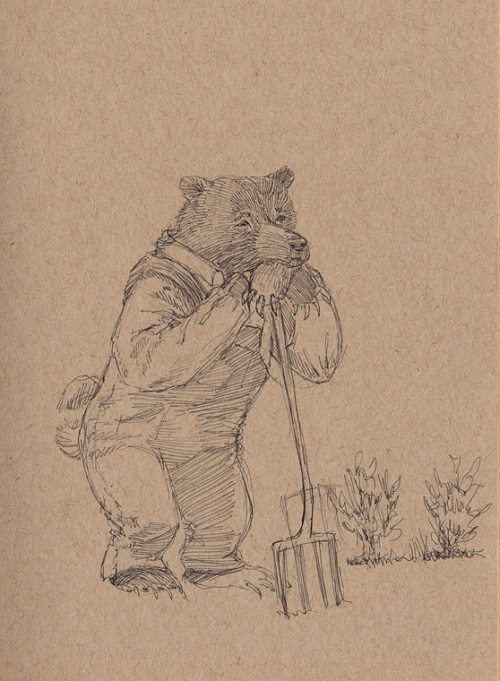 Then on a Friday afternoon, a completely new way of looking at the illustrations burst into my mind. 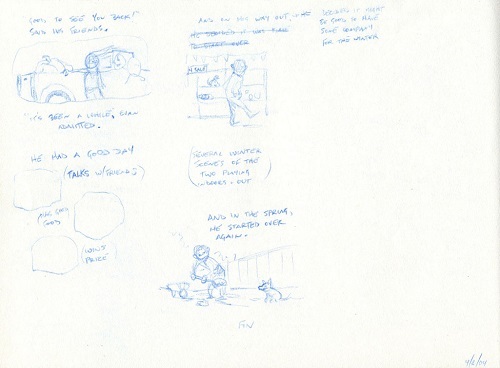 Rather than full bleeds throughout, there would be a number of vignettes and pages in which Evan would appear on a stark, white background. 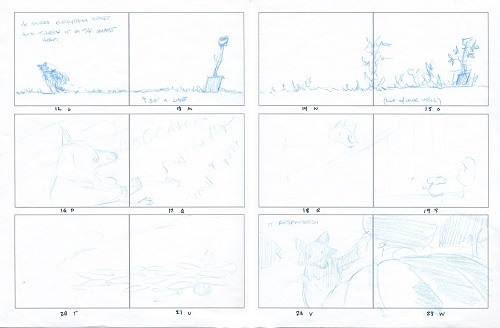 This is one of the pages I drew that afternoon; though the sketches are extremely rough, most of the ideas in these sketches made it through to the final book. Something about the lean lines and the expressive ears and tail told me that I was going to be able to show a wide range of emotions with this animal. Unless I’ve got a series of images that all happen in the same place and with the same lighting, I’ll do a color study for each piece. These are very small — you can see a penny in the image with the garden, which is for scale — and loose. These are quick studies, and so I feel very free to experiment with color mixes and combinations that I wouldn’t necessarily plan. With the “and soon it was” spread, I was looking for the colors to dull out, and I decided to do the sky as a watercolor wash under the acrylic foreground, because it gave a slightly pebbly, grubby look. I hadn’t expected the trees in the back to be so greeny-gray, but I liked how they looked, and they became the “hook” on which the rest of the illustration was hung. When I first sketched Evan, the main character, watching a pumpkin vine come under his fence, it was with a much wider focus — Evan’s whole body, the fence, the pumpkin vine. But then I decided to change the angle and the focus. So, now all we see are Evan’s feet, the hoe, a hint of the fence — and the rest of the image is about the vine. I liked that we can’t see what Evan’s thinking. It seemed to heighten the moment of discovery. I did a version of of the drawing with shadows thrown in, and I liked it. But then I decided that we shouldn’t see the hoe; it ought to be suggested in the shadows on the ground. 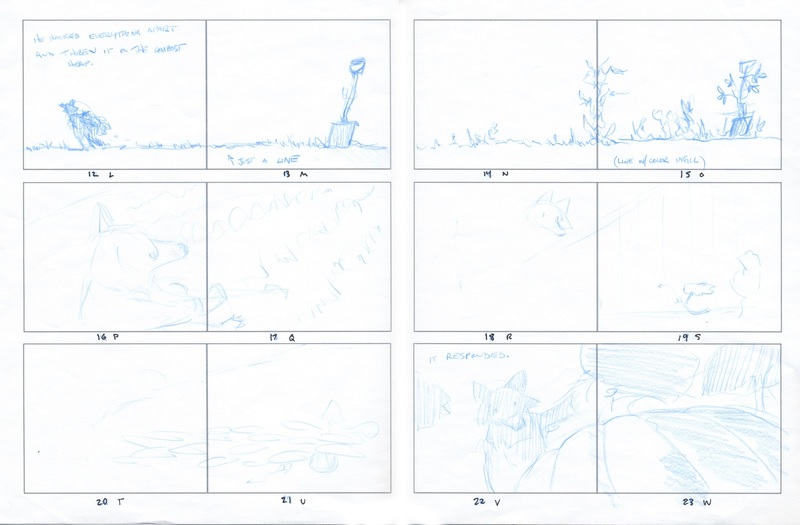 Now, the piece would be about the moment where Evan hesitates. The hoe is raised. … but he stops. 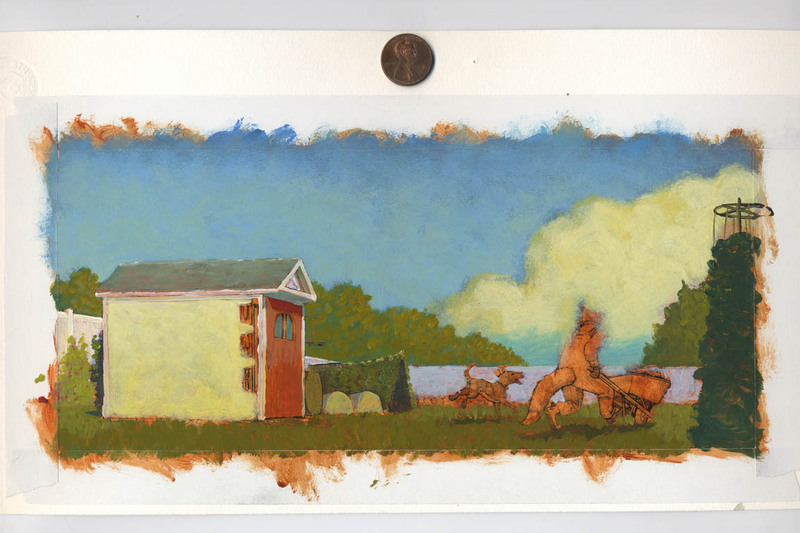 This is the underpainting with the fence painted in. 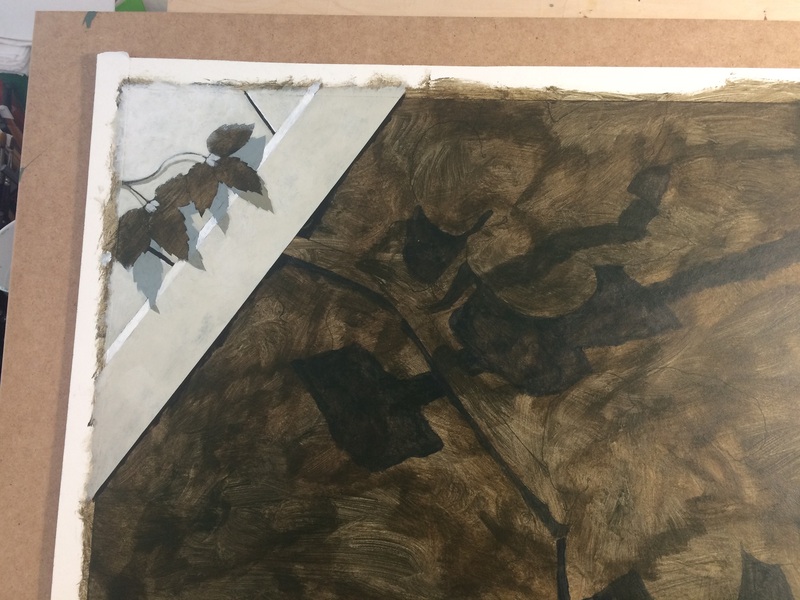 You can see the shadows of the leaves and the hoe. Notice also that I’d decided that Evan should be in boots, rather than barefoot. 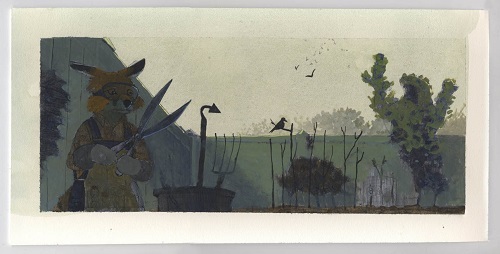 It was more consistent with other gardening images where he’s seen in boots. And there was another moment of serendipity. 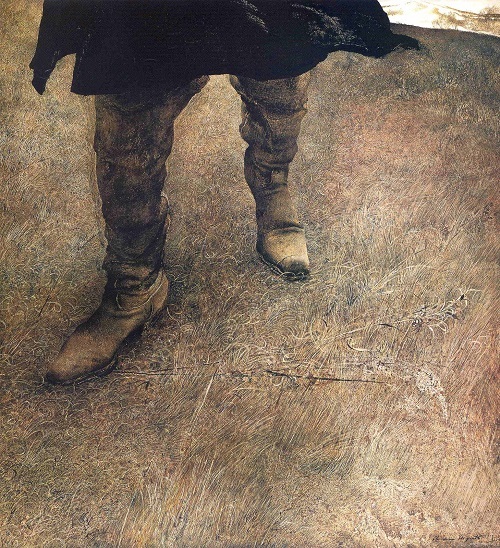 After I drew the boots, they reminded me of Andrew Wyeth’s painting Trodden Weed. That echo, to me, added a hint of bleakness to the piece. Next, I’m working on scumbling and stippling the dirt. 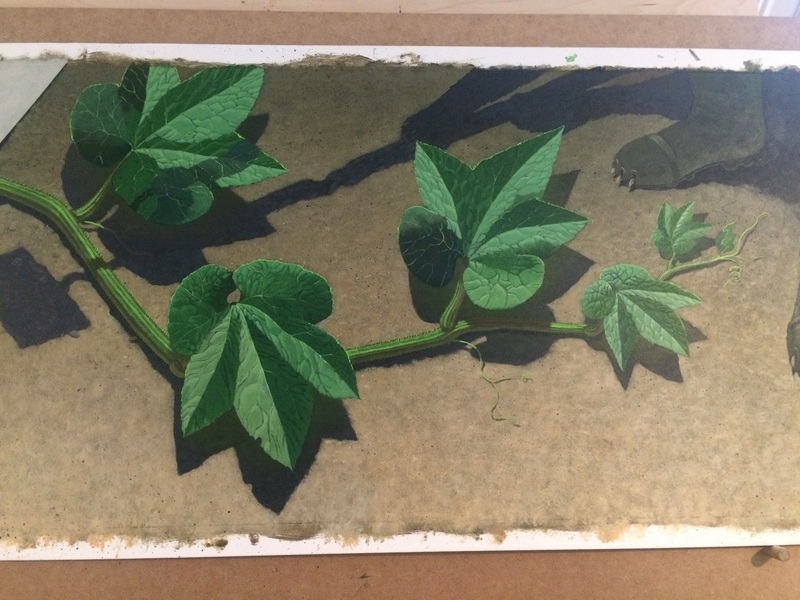 I was going for an artificial, spot-lit effect in order to heighten the shadows of the vine. Then it was time for texture in the dirt. 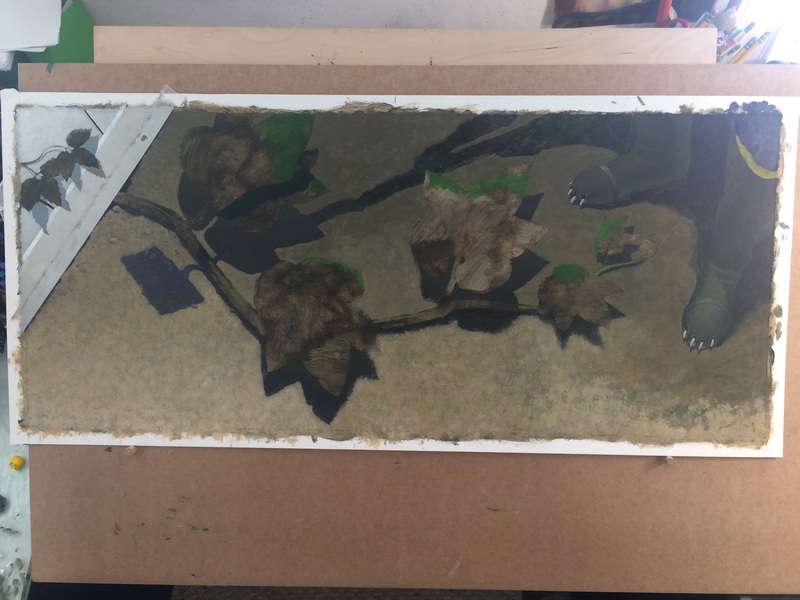 I didn’t want my spatter-texture to spill over onto the leaves, fence, or boots, so I took a copy of my rough sketch and created loose stencils. You can see them weighted down with coins. Finally, it’s time for the pumpkin leaves themselves. 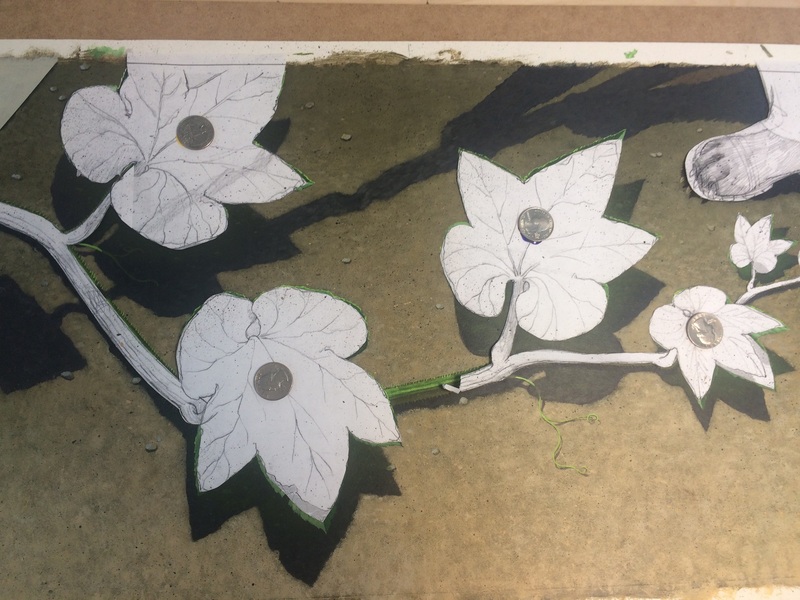 I’d done a couple of test swatches and discovered that the leaves looked more convincing if I painted the shapes between the leaf veins, rather than painting the veins over a flat color. Unfortunately, this meant painting many hundreds of individually-modeled shapes, all aligned with the source of light in the painting. But you have to do whatever it takes to get the final effect! 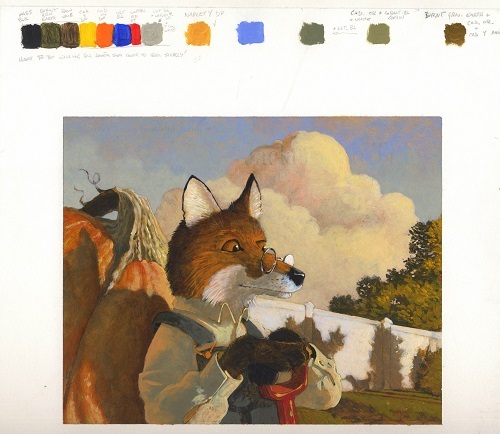 The finished image is below — with the text in place. I liked the poison ivy on the fence. 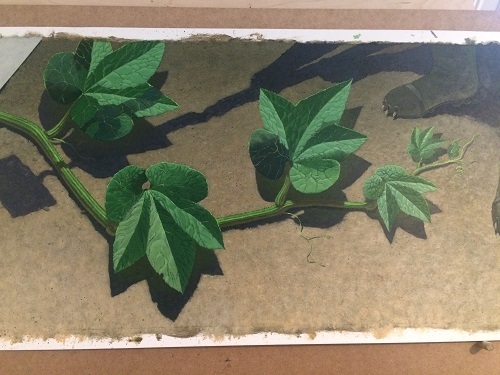 To me, this piece encompasses much of the story — the dark garden, symbolized by the poison ivy; Evan’s thinking process in the suspended hoe shadow; the vivid, unstoppable green of the pumpkin vine. 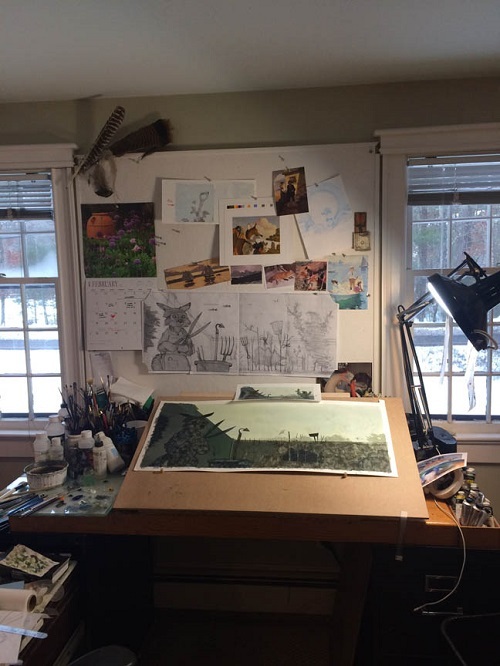 This is my drawing table while I was working on the book. 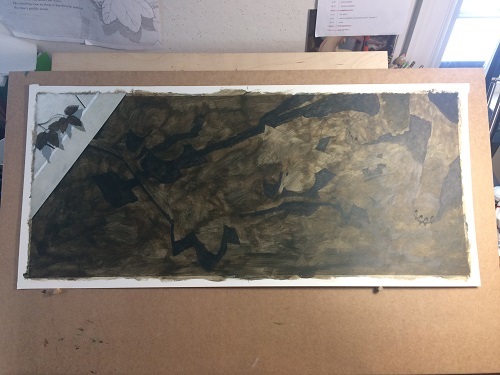 A print-out of the rough sketch is up on the bulletin board, along with various reference images. The small color study is resting above the illustration I’m working on. It’s February 2017, so the front yard is filled with snow. Jules: Thanks again to Brian. 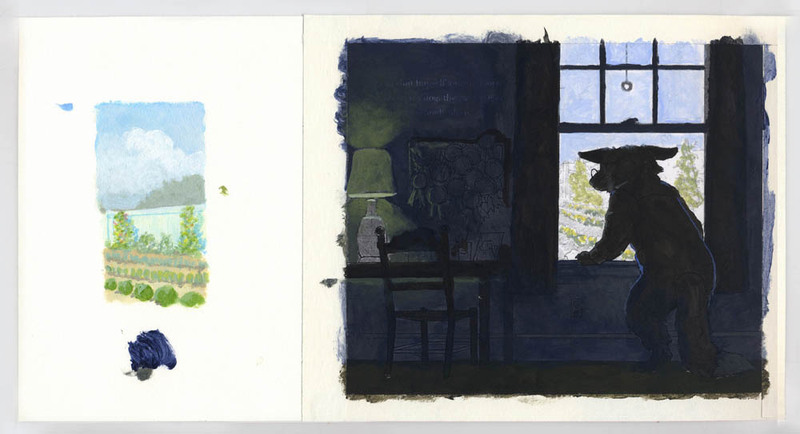 Here’s a bit more art from the book. “They played games and enjoyed sweet treats. 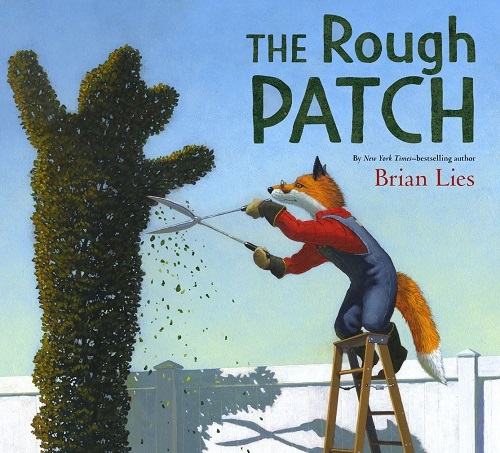 THE ROUGH PATCH. Text and illustrations copyright © 2018 by Brian Lies. Published by Greenwillow Books, an imprint of HarperCollins, New York. All images here used by permission of Brian Lies. I LOVED that bear. 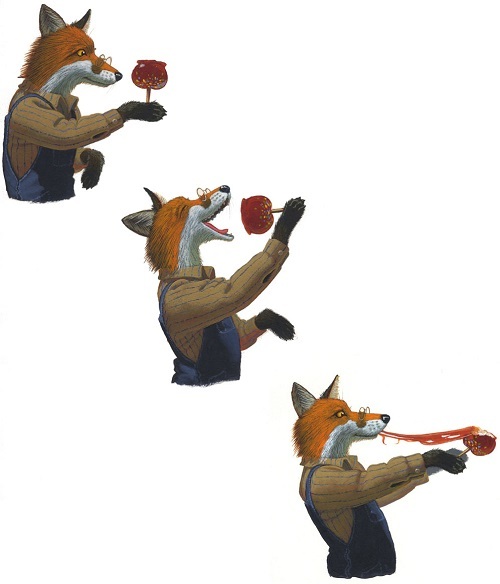 And yet, the fox is… perfect. The title to me is quirky and intriguing – going through a “rough patch” means a bad time – but is that always true? Now I want to know! 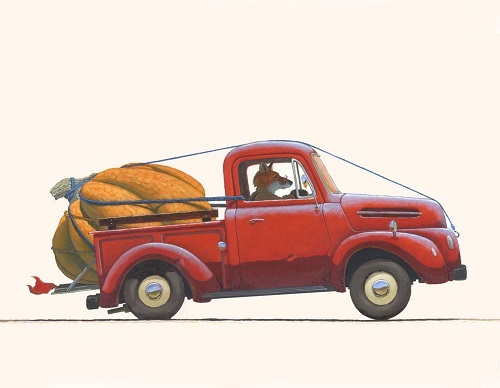 It’s always so fun to see the way illustrators add dimension and contrast to their work. This is another amazing interview! 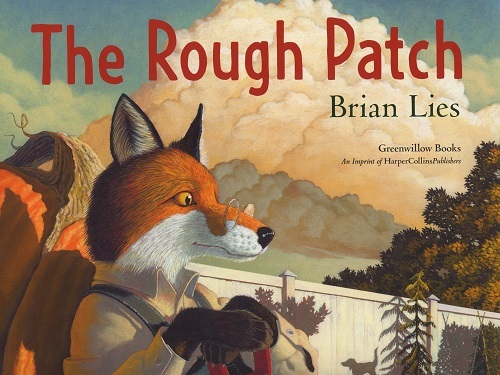 I loved seeing how he developed a character through drawing and experimenting with different animals. 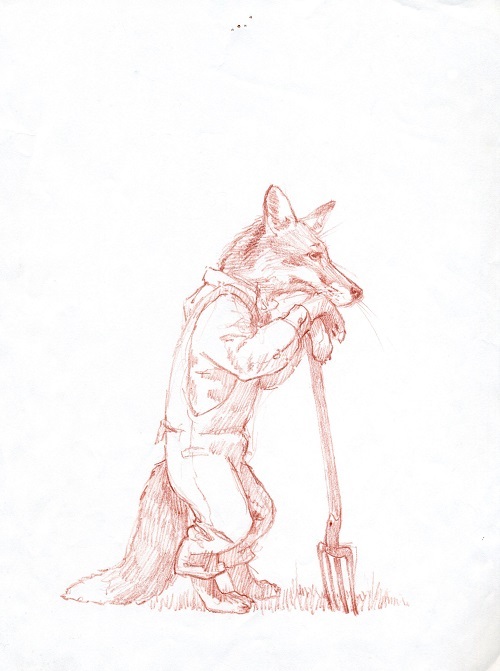 I liked each animal that he drew, but I agree with him that the fox was the best one for his story. Thanks for another great interview.